Here is the story of C. Subramaniam, an unsung hero of the Faith who shall always be remembered for a unique service he rendered the Faith. From the day of accepting the Faith, C. Subramaniam served the Cause with such devotion, forsaking his personal comfort and health till his last breath. Upon his passing, C. Subramaniam came to be eulogized as “one of the descendants of the Dawn Breakers”. He occupies a unique and unparalleled place in the history of the Faith in Malaysia. Subramaniam, who later came to be called C.S. Maniam by the Bahá’í community or “Big Eye Maniam” by his close friends on account of his squint eye, first heard about the Faith in his hometown of Seremban in the state of Negeri Sembilan, Malaysia. He, with his brother Sittambalam, used to follow the late Mr. S. Satanam to the Seremban Bahá’í Center to listen to talks on the Faith given by Mr. Yankee Leong, the first believer of Malaya and K. Rajah, another elderly believer. While Maniam’s brother Sittambalam was reluctant in accepting the Faith, it was Maniam who decided to accept the Faith in 1961. From the time Maniam accepted the Faith he was deeply involved in Bahá’í activities as he was on fire with the love of Bahá’u’lláh. Coming from an orthodox Sri Lankan Hindu family, life was rough for him at home. In a way, he became an outcast within his own family as he was not willing to blindly follow the ancient customs and traditions which conflicted with the Bahá’í teachings. He made his stand very clear and strong. Although deeply depressed with the treatment he received at his home, Maniam found joy and consolation in mingling with the believers in the Seremban Bahá’í Center. It was Yankee Leong, S. Satanam and K. Rajah who deepened him in the teachings. Later Maniam resorted to wide reading on the Faith. He was a student when he accepted the Faith. After completing his training as a teacher from the Day Training Center, he started his teaching profession in a Secondary School in a remote town of Batang Kali (Sekolah Menengah Batang Kali) in the state of Selangor. He remained a teacher in that school till his passing in 1970 and was known as the only key believer in his area that consisted of the twin towns of Batang Kali and Kuala Kubu Baru. Life was quite lonely for him, especially in the absence of other believers in that area. But Maniam well understood his role in the remote town. He took it upon himself to promote the Faith in Batang Kali area. While trying to establish a base in Batang Kali, he made frequent trips to Kuala Lumpur and Petaling Jaya towns to participate in activities. It was from such outstation trips and activities that he constantly received his spiritual nourishment, inspiration, and enthusiasm. Dr. Muhajir seated in the centre, meeting with some believers at the residence of Dr. Wolff, 1962. Seated at the extreme left in the front row is Tony Fernandez. Third from left is Sabapathy, with Dr. Wolff next to him. Seated on the left of Dr. Wolff is C.S. Maniam. Seated to the left of Dr. Muhajir is Elinor Wolff, with Lily Ng from Seremban next to her. Standing (L-R) Mahesh Dayal, S. Bhaskaran, Inbum Chinniah, Lily Chinniah, Leong Tat Chee, K. Rajah, Mirinal Kanti Paul. Maniam used to attend Bahá’í meetings in the rented bungalow of Dr. Wolff until the latter left the country in 1964. 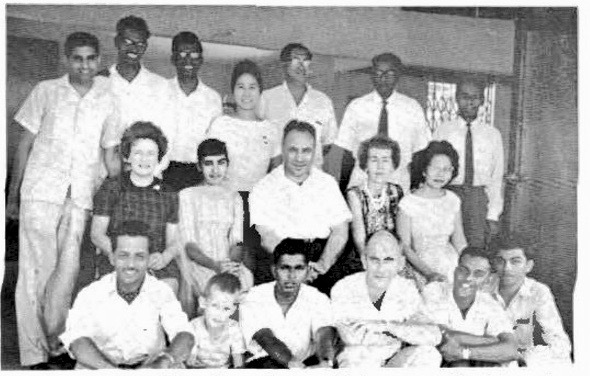 Dr. Wolff, who was a medical officer from Hawaii, and his wife Elinor Wolff came to Petaling Jaya. Dr. Wolff was a nutrition expert from the World Health Organization who came to Malaya to study the dietary habits of the Asli (aboriginal) people of Malaya. Dr. Wolff himself had visited the aboriginal villages and had many stories to share. During his visits to the bungalow of Dr. Wolff, Maniam got to know the early teachers to the Asli areas. He had a liking to go for teaching in the jungles, which only came to be realized in the later part of the late 1960s. 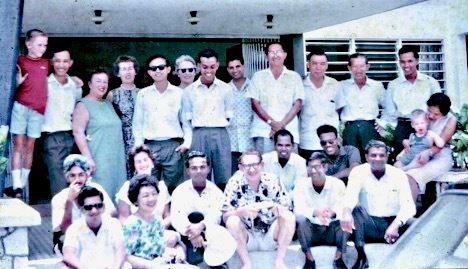 Residence of Dr. R. J. Wolff (Mrs. Elinor Wolff is standing fourth from left in Petaling Jaya, April 1963. Maniam is in the centre seen standing and facing downwards, and to his left are Mahesh Dayal, Leong Tat Chee, Wong Kok Mee, and Yankee Leong. Standing at extreme left, next to a boy in a red shirt is Leong Ho San. Maniam never missed major Bahá’í conferences from Petaling Jaya town in the state of Selangor to Kuala Kangsar town in the state of Perak in the north. Until the time of his passing Maniam was a permanent attendee at national conventions held in Kuala Lumpur, and several of the summer schools held in Port Dickson and Malacca. Thus Maniam was a well-known servant of the early believers. First National Bahá’í convention, 1964. Maniam is second from right in the third row. Kumara Das is at the extreme left in the second row. K. Krishnan of Ipoh and Mariappan of Seremban are at the back row, left. It was through his determination and labour that towards the mid-1960s there were a number of people who had accepted the Faith in Kuala Kubu Baru town. He shared this joyous development with individuals and institutions. In a letter dated 15 September 1966 addressed to the Local Spiritual Assembly of Kuala Lumpur Maniam wrote, “At last the blessings of Bahá’u’lláh have come to us in establishing a group of Bahá’ís in the small town of Kuala Kubu Baru. There are at present three Bahá’ís and they have started on their own in teaching the Faith to their friends….”. This was one of the early achievements for the Faith in this area. But it happened that these newcomers to the Faith were lukewarm believers. Maniam saw that one of the ways to deepen the Bahá’ís was to expose them to the Bahá’í gatherings where they would be touched by the Bahá’í spirit and fellowship, an experience seldom to be experienced in the wider community. 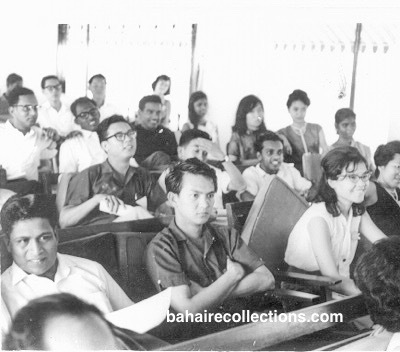 In 1968, Maniam brought 15 youths to the Summer School held in the coastal town of Port Dickson. True enough after being exposed to the Bahá’ís and the Bahá’í spirit all the 15 youths accepted the Faith. The youths even promised to form a Bahá’í society in the High School upon their return. Maniam himself spoke at the Summer School on the power of positive thinking and advised the friends not to worry unduly about problems which could always be overcome. On all weekends, he was actively involved in Bahá’í activities in the states of Perak and Selangor. It was only on rare weekends when there was no Bahá’í activity that he would visit his home in Seremban. After a quick visit to his parents, he would rush over to the Bahá’í Centre in Seremban to meet the Bahá’ís and join them in their activities. He had a fond liking for Bornoh Das with whom he spent most of his time in Seremban. Likewise, he did not miss meeting up with elders like S. Satanam, Isaac de Cruz and Lily Yan. Yet his full concentration was back in Batang Kali area, where he was carrying high the torch of the Blessed Beauty, hoping to establish an assembly at the earliest. Maniam had an old model of the “Ducati” motorcycle with which he had been traveling around Batang Kali and Kuala Kubu Baru towns to teach the Faith. Throughout his Bahá’í life, Maniam labored to establish an assembly in the towns of Batang Kali and Kuala Kubu Baru. Since there was not much manpower, he would invite friends from other parts of Malaysia and provide accommodation and food to enable them to teach the Cause in those towns. He had a great obsession for teaching the Faith. Though living a lonely bachelor life in Batang Kali, he always invited Bahá’í teachers and visitors from Selangor to develop the area. His three-room house was a self-teaching centre with the photograph of the Master and the Greatest Name hung prominently on the wall. He piled up sufficient stock of Bahá’í books and pamphlets for teaching. He offered assistance to the teachers to the Asli villages to stay overnight in his three-room house in Batang Kali. He would urge those going to the Asli areas to visit him on both the upward and return journeys. The Asli teachers from Kuala Lumpur have to pass through Batang Kali town before reaching the destination in the state of Perak. They used to board a bus in Kuala Lumpur and stopover in Batang Kali and stayed overnight in his house, before proceeding to the Asli teaching areas. His hospitality for the visitors was very magnanimous. Some of the Asli teachers like Kanagaratnam and Ravi Upendra used to visit him on their way to their Asli villages in Trolak, Sungkai, and Bidor areas, and to this day speak of the magnanimity of this pure soul. Whenever Bahá’í visitors came to visit him, Maniam would arrange firesides in the Chinese coffee shops, with Maniam footing the bill. That was how some of the teachers in the school where Maniam was serving got to learn of the Cause. They did not accept the Faith, but their admiration for Maniam and the Cause grew even bigger, as they could reason out why Maniam was much different from the rest in their company. In those days, there were not much telephone facilities, and the Bahá’ís would turn up at the doorstep of Maniam’s house without prior notice. Yet Maniam would be the happiest person, and he welcomed them and made all arrangements for their comfortable stay in his house, and provided the best hospitality. If there was a need, he would take an emergency leave from school to give serve them. Maniam made full use of visits by such teachers to accompany them to the remote towns such as Rawang, Batang Kali, Kuala Kubu Baru, and Slim River. When visitors came alone, he would take them on his “Dukati” motorcycle for teaching in those places. But when more friends came he used to hire a car and a driver and take them for teaching to towns which were situated further away. With extreme gladness, Maniam would foot the bill for the hiring of the car and the food for such daylong trips. The friends who stayed in his house in those days observed that Maniam used to get up at 4:00 am and recite with a loud voice the Long Obligatory Prayer in his room, at a time when not many believers had developed this practice. There came an opportunity for Maniam to be transferred to another town with a promotion in his career. But Maniam declined the offer and was satisfied with no promotion. This was because he was obsessed with promoting the Cause in Batang Kali town. As a lonely servant of Bahá’u’lláh in Batang Kali, Maniam was missing important Bahá’í events like feasts and Holy Days. His closest place of activity for the celebration of Bahá’í holy days was Kuala Lumpur. When Vasudevan started to function from Kuala Lumpur as secretary of the National Spiritual Assembly in 1966, he came very often to the national Bahá’í Centre to be in the company of several Bahá’í youths from Petaling Jaya town and the Kuala Lumpur Technical College who frequented the centre. By 1969, he had developed a close friendship with the staff of the National Bahá’í Centre, among whom he was closest to C. Kanagaratnam. To Maniam, it was a great joy to visit his the National Bahá’í Centre over the weekends. Knowing that the staff of the centre was paid a simple allowance, he would on each visit take the staff working in the Bahá’í Centre for meals. Most of the time he would take them on a bus from a bus stop in front of the Bahá’í Centre in Setapak area to an Indian banana leaf restaurant located in Jalan Tuanku Abdul Rahman in the centre of Kuala Lumpur city. There Maniam would treat them with unlimited and sumptuous meals. He would arrive on Friday night after work and return late on Sunday night. He was very magnanimous in financially assisting the Bahá’í youth with no means. From 1969, Maniam increased his visits to Kuala Lumpur as there was a new dynamic force of attraction-Inbum Chinniah who had moved into Kuala Lumpur from Jasin. Despite Inbum’s busy nature of work as a national secretary, he made it a point to spend time with visitors, and Maniam found a new meaning and greater comfort in visiting the National Centre more often than before. 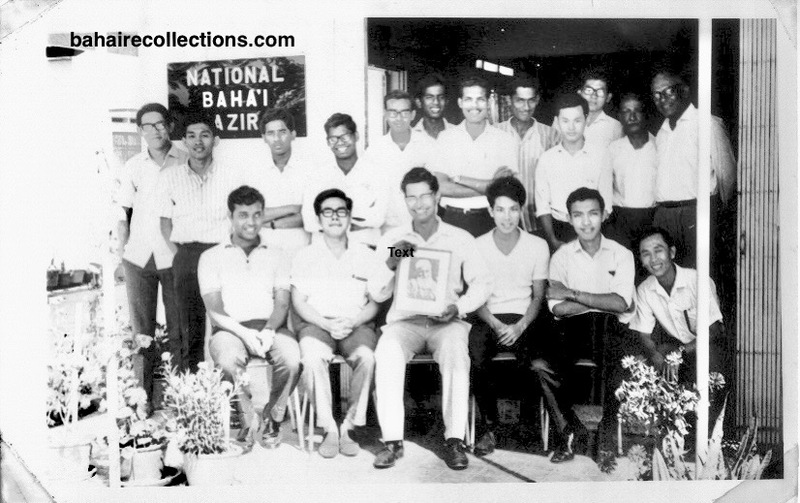 Bahá’í youth from Kuala Lumpur Technical College and Petaling Jaya at the National Bahá’í Centre, 1967. Holding the photo of the Master is S. Vasudevan, Secretary of the National Spiritual Assembly. Maniam is seated at extreme left. Choo Yoke Boon is seated at extreme right. Appu Raman stands at extreme right, with Lim Kok Hoon (third from right), S. Sukumaran (fifth from right) Joseph Swaminathan (sixth from right), Kuppusamy (seventh from right), V. Theenathayalu (eighth from right) A.P Arumugam, (ninth from right). From the year 1962 Maniam had wanted to visit the Asli villages. It turned out that in 1969, his friends in the National Bahá’í Centre were frequent visitors to the Asli areas. When Maniam came to visit the Bahá’í friends in the Bahá’í Centre, he was very thrilled to listen to stories of teaching activities in the Asli villages by Asli teachers like Kanagaratnam and Selvarajah who were staying in the centre. He saw that Bahá’ís were making frequent trips to the Asli areas in Southern Perak and he himself expressed interest in serving in those areas. Maniam was appointed to the National Asli Committee on account of his great passion for Asli teaching. He worked extensively and closely with the Asli friends from early 1970. His first trip to the Asli areas in the company of Isaac de Cruz, S. Satanam, and Rama Naidu was indeed rough and simply a wild experience for Maniam. In that trip to the Asli villages near Bidor town, Maniam observed how other teachers taught the Faith to the simple aborigine people, and learned on how the simple souls were deepened and how Nineteen Day Feasts were conducted. It was on that trip that Maniam saw the sacrifices of the Asli teachers who were exposed to much hardship in the jungle with no basic comfort, and bitten by leeches. Maniam having a big body frame was not able to walk fast in the jungles. He got entangled in a huge bush thorn with deep injuries to his flesh. Satanam, Rama Naidu and Isaac had to cut away the thorn bushes and extricate him. The Asli teachers often returned infected with malaria. Yet Maniam remained uninfected and continued to go into the jungles. Whenever the Asli friends used to come for the national convention, Maniam sought their company and conversed and consorted with them with full love and sincere feeling that they too took a great liking for him. He was soon a darling of the aboriginal friends. But he decided to continue joining the Asli teachers in another teaching trip in late August 1970 lasting for one week in the company of Machamboo, Isaac de Cruz, Kanagaratnam and Ravindran Upendra. They arrived in Sungkai town in the state of Perak, where they were paired off with the other Asli teachers and off they entered into the jungles. They visited the areas of Jernang and Jelai. The villages they visited were Kampong Sooi in Bidor and Kampong Jerjak in Sungkai. It was in Kampong Jerjak, that Maniam taught the Faith to the jungle natives. In this trip, they went through high and steep hills, covered with tall trees and thick and wet undergrowth with thorns. The foliage is so thick it is quite dark even in the day. Everything was damp and smelled of rotting wood. Leeches were everywhere – in the water, on leaves and branches along with centipedes, millipedes, spiders and of course snakes. These posed great difficulties for Maniam. Maniam was groaning with exhaustion and repeating “Yá Bahá’u’l-Abhá.” Yet friends noticed there was inner happiness within him, probably from the love he had for Bahá’u’lláh. They all returned to Kuala Lumpur after seven straight days in deep jungles. Maniam’s close friends in Kuala Lumpur were very concerned for Maniam’s lonely life. They saw that Maniam was daily involved and immersed in spreading the message of Bahá’u’lláh, with little time for luxury, including starting a family for himself. Those friends urged Maniam to consider getting married. Maniam was hesitant as he was obsessed with teaching the Faith and strengthening the base in Batang Kali. He had quietly whispered to the friends that there was more important work to be done for the Faith, and his marriage was only secondary. But the friends pressed on and convinced him that he could serve better as a family man. Finally, he gave serious thoughts to the sincere pressure from friends. There was a Chinese Bahá’í girl, adopted by Indian parents. She stayed close to the Bahá’í centre. They were both introduced to each other and after some meetings, they seem to have taken the marriage proposal quite positively. Maniam met the girl quite often and were getting to know each other and were ready to take up the matter to the next level that is seeking parental consent. Maniam’s close friends like Kanagaratnam, A. Govindasamy, Selvarajah, and Jayaraman walked him over to the house of the girl, after giving ample notice. They all met the parents of the girl and made a formal proposal. Parental consent was obtained from the girl’s side. Half the battle was won. Maniam had to now get consent from his own parents. Maniam left a word that he would come back from his imminent Asli teaching trip, followed by the Oceanic Conference in Singapore in early January 1971 and obtain consent from his parents. He promised that once his parents had given the consent, he would come over with his parents to discuss the wedding plans. But fate had its own way, as they say. In early December 1970, Maniam undertook a teaching trip to the Asli area in the deep jungles, with the joy of imminent marriage in his mind. Maniam came to the house of Benedict Chee, a boy scout and only 15 years old then, to encourage him to join him in the teaching trip to the Asli areas. Mrs. Theresa Chee, mother of Benedict Chee was more than happy to have Benedict exposed to the hardships in the jungles. The next day they arrived in Bidor and were met by other Asli believers and were paired off to enter the jungles. They went to the Asli village of Kampung Chang in the state of Perak for a week. In this trip, they went into the jungles primarily to brief the aboriginal friends on the preparations needed to participate in the Oceanic Conference scheduled to be held in Singapore in early January 1971. Then the unfortunate and unexpected happened. While in the blessed teaching field Maniam and Benedict Chee had contracted malaria, which had manifested itself fully only after they were out of the jungles. At first, Maniam went to visit his parents in Seremban, while Benedict Chee visited and stayed with his grandmother in the same town. One week later news came that Maniam fell very sick and was rushed to the Intensive Care Unit of Kuala Lumpur Hospital as his malarial attack was too unbearable. But Benedict Chee recovered fast after taking malaria tablets. The Bahá’ís staying in the Baha’i centre in Kuala Lumpur came to know about this, and they rushed to visit him. The girl who was to marry him too was taken along. It was too unfortunate for them to see such a great soul had slipped into a coma by the time they reached the hospital. He was therefore unable to communicate with anyone. The friends were deeply depressed. Only three weeks ago he was making arrangements to go for the historic Oceanic Conference of the South China Seas in Singapore and was planning to speak to his parents on his marriage. News spread of his admission into the hospital and the believers prayed hard for his speedy recovery. But the Divine will had been otherwise. On Monday, 21 December 1970, he passed away at a tender age of 30, exactly ten days before the Oceanic Conference. The group of friends with whom he was going for Asli teaching could not take his untimely passing at such an early age, especially when the wedding plans were on way. The girl he was supposed to get married to was so devastated that she did not come out of her room for one whole week. The friends of Maniam had to pacify her by visiting her often. Since his parents were from Hindu background Maniam’s remains were taken to Seremban town and cremated. Maniam had never left a will for a Bahá’í burial as he himself would not have expected an early passing at that tender age. With the cremation of Maniam’s earthly remains, nothing remained of him, except the meritorious services he had rendered. A few days after Maniam’s passing, his father Mr. Chinnadurai, a retired officer at the Negeri Sembilan State Treasury where Mr. K. Rajah worked donated a huge collection of Bahá’í books belonging to Maniam to the Bahá’í Centre in Seremban. When Benedict Chee heard of the passing of Maniam, he was too shocked. He recollected Maniam repeating in the jungles, “Ben, this would be my last trip and others have to bear the torch. I am too old and do not have the energy I had before.” Benedict Chee pondered if Maniam knew his days were coming to a close. From the time Maniam accepted the Faith, he was highly energetic, active and full of enthusiasm to serve the Cause. Wherever he went he was admired as a good Bahá’í, full of humility, humor, and radiance. Maniam was always obsessed with teaching the Faith. He was always full of strong energy and high spirit. Maniam was willing to do anything for the Faith and rose to the occasion any moment he was given a task. Whenever he was invited for teaching he was the first to be rushing in the forefront. There was no second thought or hesitation in his mind where service was concerned. His magnanimity in giving financial assistance to needy Bahá’ís saw no bounds. Maniam was always a simple person, well dressed and full of humour. All he loved was a radiant and joyful atmosphere for which he himself was a great contributor. Each one, Bahá’í or non-Bahá’í who had associated with Maniam said that Maniam had the rare virtue of going out of the way to help others and make their life comfortable during moments of need. The admiration for this lovable Maniam who gave his life during the course of his service for the Faith cannot be simply defined with adjectives. He was indeed a rare believer gifted to Malaysia by the wondrous hands of Bahá’u’lláh. Maniam had set an example on how a lonely and isolated believer could do wonders in serving the Cause with distinction. 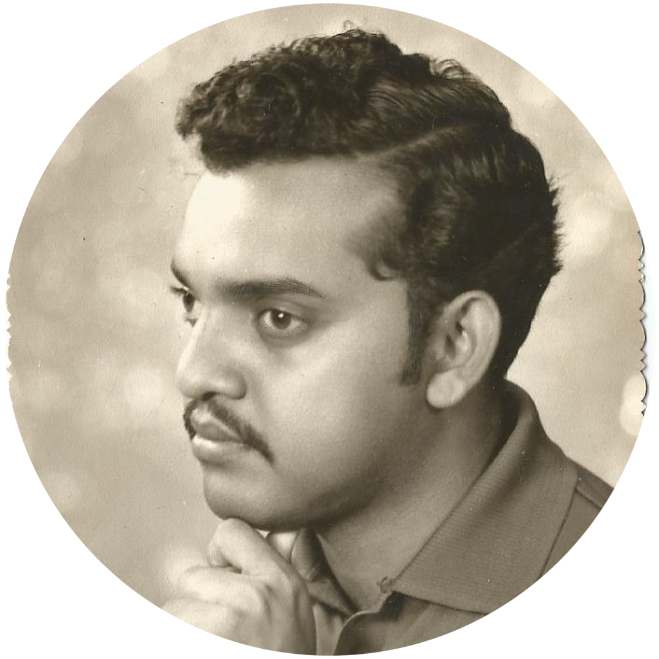 History has it that Maniam was the first in Malaysia to have laid his life in the path of service in Malaysia, and shall always be remembered as a descendant of the Dawn-Breakers. He has indeed made the Malaysian Bahá’í community proud in his own way of service and living an exemplary Bahá’í life!